CLEAN-N-VAC Model AC-35 automatically removes dust, dirt, carton lint and other foreign matter. Using a combination of high pressure ionized air and highly efficient vacuuming. Automatic bottle cleaner, which inverts the containers, blasts them with ionized air and vacuums them over an effective length of up to 18 inches. 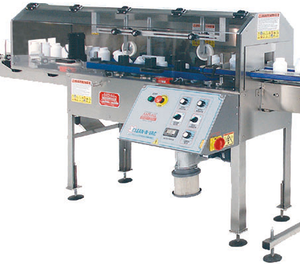 Fully adjustable inverting mechanism to handle a wide range of containers. Minimal changeover parts needed for a wide range of plastic, glass metal, corrugated, round, square, rectangular and oval containers etc. Heavy duty welded stainless steel construction frame. Electronic variable speed controls for all turning and cleaning functions. Non marring contact parts throughout. Can be used with existing conveyor or with a stainless steel Conveys-All Conveyor. Polycarbonate safety covers and stainless steel guards throughout allowing wide access for easy adjustments. Hand wheels and calibrated settings allow for ease and repeatability of changeovers. Computer designed for a quite, smooth, dependable operation. Complete with 44" intake DC variable speed conveyor and metering wheel. Left to right conveyor discharge is standard right to left is available. Interlocking safety switches on front hinged guard so that the machine will not run unless the door is fully closed. Low profile design for increased safety, no need for ladders or step stools.